Man, you're churning them out, Simon, but with no drop off in quality! Fantastic work. Hi Aaron, yes I really don't want to let the quality slip, they are getting a little bit better as I go! I´m realy impresses by your diligence in this project, will be very nice to see the units based up. Very nice, it is good to see that kind of perseverance. It will be a sight to behold, can't wait for the photos of the whole army! I will be buying a hellenic army soon too! 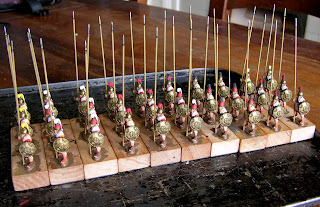 I look at my few dozen Romans languishing on my desk and am ashamed! Brilliant stuff this! Excellent painting. I admire your endurance on this project, it will be well worth the effort! Thanks all. I've just inked them all , and made a start on the next batch of 21. Again, I salute your focus and powers of concentration, Simon.